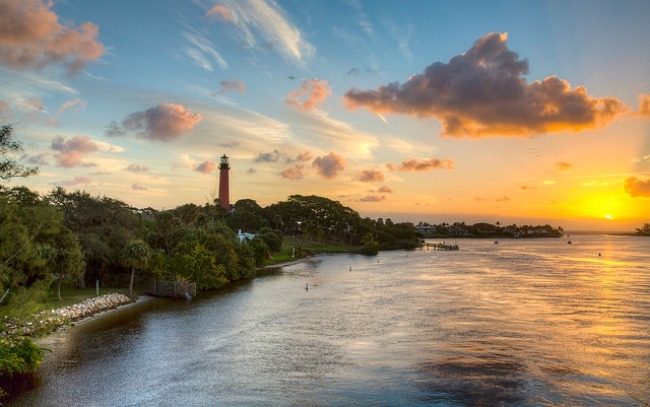 Florida’s got a big nutrient loading problem in its rivers and estuaries. Too much phosphorous and nitrogen can trigger algae blooms that choke the oxygen right out the water and cause incalculable damage to riverine ecosystems. This problem is not news, really. It’s happening in waterways all over the United States. Why? Agricultural runoff and sewage top the list of culprits. But along central Florida’s Indian River Lagoon, the problem is especially acute. Every year more than 4.4 million pounds of nitrogen wind up in the 156-mile long Indian River Lagoon. The lagoon experienced a huge “super bloom” in 2011, affecting an incredible 90-mile stretch. The super bloom killed hundreds of thousands of fish and triggered sporadic — and ongoing — die-offs of pelicans, manatees and dolphins. Yes, it’s that bad and it must be stopped. Some experts think the situation can be improved by getting rid of old residential septic tanks near waterways and connecting those homes to public sanitary sewers. 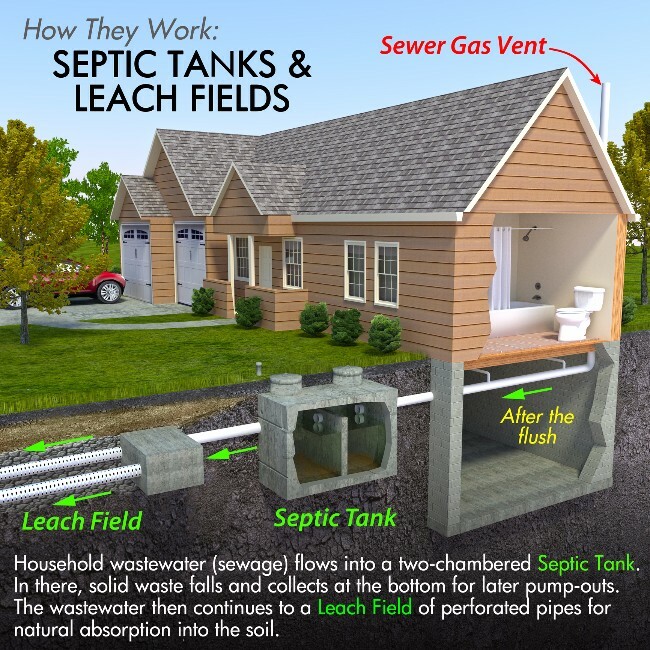 One third of American households use septic tanks. Part of the problem is that people often don’t report it or fix it when their septic systems begin acting up. Families may not report a failing septic system for a host of reasons. . . Families fear that their home may be condemned if they notify authorities that their sewage is not properly treated or that they will be forced to make repairs they cannot afford. “There are a lot of [septic tanks] that are failing now that we don’t know about, and people just live with them,” one county health official told the researchers. Septic tanks that sit unrepaired and unpumped eventually leak — and all that sewage enters the nearby soil. If the system is near a river or lake, the contamination eventually makes its way there. And if multiple systems in a housing development have the same problem, the effects multiply. That’s why the town of Rockledge, Fla. is removing 140 aging septic tanks from a 1960s-era subdivision called Breeze Swept. Rather than expecting the homeowners to pony up the required $10,000 or more to connect to sanitary sewer lines, the state and city will fund a multi-million dollar project to add 6,600 feet of sewer lines and connect 400 residents. Not everyone thinks spending boodles of money on septic tank removal is the best way to combat pollution in our rivers, though. Some conservation groups like the Florida Oceanographic Society (FOS) feel this money would be better spent tackling agricultural runoff. They claim that runoff is responsible for much more pollution in our rivers than septic tanks ever will be — and they’re not wrong. A typical 200-home subdivision can generate about 7,200 pounds per year of nitrogen. When you stack up these numbers against agricultural runoff, however, they pale by comparison. Agricultural crops covering the same amount land will generate about 33,000 pounds of nitrogen per year. Most of that runoff is fertilizer and livestock waste being washed away by rain and into our rivers, streams and lakes. According to the Environmental Protection Agency, there are a number of ways to reduce this problem – including planting appropriate cover crops, planting buffer areas with trees, shrubs and grass, avoiding the over-application of fertilizers, tilling fields less often and managing livestock waste. 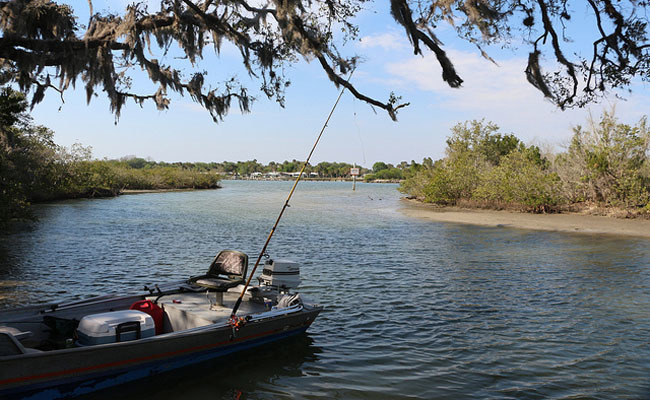 In 2013, [the Florida Department of Environmental Protection] began the Basin Management Action Plan to reduce nitrogen inflows into the estuary. The 15-year plan outlines nitrogen reductions for 22 entities within the watershed, the top one being agriculture at a starting load of 1.56 million pounds per year. Reductions required for agriculture were set at 925,029 pounds per year, and in the first five years agriculture reductions are supposed to be 277,508 pounds per year. However, DEP granted agricultural outfits credits for “best management practices” and land-use changes totaling 468,702 pounds per year. In other words, agriculture seems to be getting more credits than requirements for reduction in runoff. How is that supposed to make Florida’s waters better? Getting rid of old leaky septic tanks is a laudable, worthwhile effort. Let’s hope that Florida doesn’t ignore the bigger picture, though. The state needs to get a better handle on its agricultural runoff problem, or it won’t much matter how many septic tanks are replaced. Rick Scott and his cronies don't care. They're as corrupt as it gets. Rick Scott will destroy Florida for his corporate buddies' profits. Florida is already a wrecked polluted place except for the Everglades. Thanks for sharing innovative actions, I will share and fwd. When I read articles like this, I wonder what century the average American is living in. Good idea! Florida has many ecosystems to protect. I will forward this wonderful and informative article to my friends on twitter and facebook. Thank you for this vital share. Farming run off needs to be stopped. It is a issues every where farming is done. The top soil is most important to save. That is where the food is for the plants.. All over the world people are replanting and saving soil. This also needs to be done in city's. Even Florida needs to do this. POLLUTION'S ALREADY OUT OF THE TANKS ... good job. All that's left to do is haul away the tanks, giving anything left to live below the surface an extra bit of space to move. The problem is not new... it's happening in waterways all over the United States thanks to agricultural runoff and sewage and, unless ALL such issues are addressed, this one little correction is just that -- LITTLE.